Color Temperature is a measure of a particular color effect of a light source to determine quantitatively. The color temperature is defined as the temperature of a black body, the so-called Planckian radiator, to a specific color when emanating from the radiation source. Specifically, it is the temperature at which, the light effect at the same brightness and under specified viewing conditions can be described is most similar color. 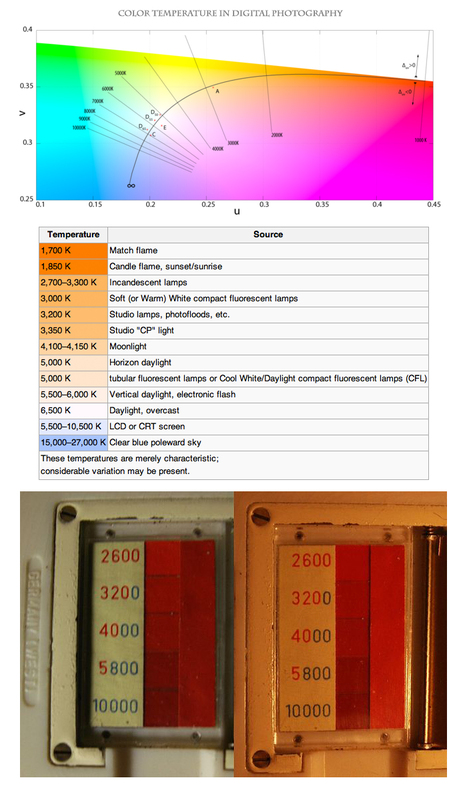 The unit of the color temperature is Kelvin (K). The spectral distribution of the light fixtures with the same color temperature can be very different, so-called metameric light sources. Metameric light, as with incandescent lamps have a continuous spectrum or limited, as in energy saving lamps and flat panel displays there are narrow spectral bands. The color rendering index is, the quality of the color reproduction under illumination with a light source. In the digital photography, the color temperature is important aspect so that a subject can be taken in the correct colors, that is, it corresponds to the natural “visual impression”. The international standard for average sunlight is 5500 Kelvin, it is the the temperature of a sunny day with clear sky in the morning or afternoon. Daylight films were sensitized that they make color temperatures of 5500 K which is a reality correct corresponding to the color reproduction possible. Tungsten light depends on the type of color temperature 3100-3400 K.
To achieve different color temperature, conversion filters are used. In digital photography , there is also White Balance settings. An incorrect color temparature reduces the quality of the picture. The corrected color temperature is obtained by adding the Mired value of the filter to the given color temperature of light. The color temperature is determined by the physically defined surface property of a radiator as per definition. The usual classification of colors is in cold or warm hues goes back to a subjective experience and can not be described by a temperature scale. Artificial light sources give different perceptions of color compared to sunlight. Mixtures of different types of light sources can even affect the well-feeling. This Article Has Been Shared 4556 Times! Mirrorless Interchangeable Lens Camera technically not the same as Bridge camera, this are hybrid Camera with good features of DSLR and Compact Digital Camera. Cite this article as: Abhishek Ghosh, "Color Temperature in Digital Photography," in The Customize Windows, April 20, 2013, April 26, 2019, https://thecustomizewindows.com/2013/04/color-temperature-in-digital-photography/.